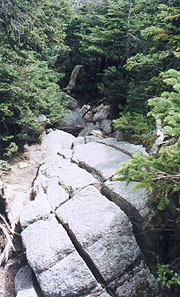 Our last section proved the White Mountains a formidable foe, but herein lies the road to Katahdin, and we could not, or would not; pass over this opportunity. Our wounds healed from last month's introduction to reality, we're up for another challenge, this time heading south from Franconia Notch to the NH / VT border. I'm predicting two tough days of hiking, followed by three days of relative ease. Our well of luck has run dry, however. nor the battle to the strong . . . for time and chance overtake them all." We wake to a gray morning, and in typical AT fashion, a light rain begins as we enter Hanover NH, a quaint New England town famous for the AT's passage through the preppy Dartmouth College. The college has been very supportive of hikers in the past, allowing lodging in various frat houses, and providing parking for section hikers. The exact location of the needed A Lot seems a mystery to many of the students however, and by the time we've located it and parked, we're late for our shuttle, who passes us honking as we hoof it back to the town commons. 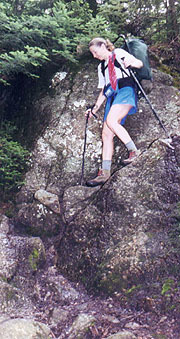 Our shuttler, Charlie, has been an avid hiker since retirment, having done a �thru-hike� in 1990-91, interrupted by the untimely deaths of Goeff & Molly (see our Feb 2002 section). As he drops us in the AT parking lot, we find a box of excellent trail magic left here, with Mountain House dinners and snacks, and we each take a little for variety. We wave goodbye at 11:20, winding down the path through the woods, but finally we cross under the familiar bridge, surprised to find a box of root beer from Sheltowee and other trail angels before heading uphill. As our last section, it starts out easily enough, which I'm almost afraid to mention for fear of jinxing it. The climb is steady but the terrain easy, and soon we pass a Boy Scout troop on a break, followed at the next stream by a coed group of kids out on a field trip. All the streams are rushing after last night�s rain, and some of the crossings are a bit challenging, especially as we come to Cascade Brook, where unable to find a good crossing, we have to track upstream quite a ways before finding rocks close enough to leap between. Even here, one of the jumps looks a bit uncertain, and I�ve started to take off my shoes for a ford when Coleen goes ahead and makes the leap; the cold water and her success persuading me to do it as well. The climb and the terrain are easy, and we pull up to the Lonesome Lake Hut at 1:10, finding it surrounded by kids and parents � obviously it�ll be crowded night here. One of the croo is cooking within, and we grab a table for our own lunch, along with a water fillup and some foot maintenance. My feet are pretty wet from my fording attempt and a modest sweat, as are our clothes in spite of the cool, but muggy weather. A long strip of duct tape around last month's blister soothes it for the time being, though soon after it�ll start slipping and be of little help. A quick chat with the croo girl yields little intel of value, so we load up and head out. There�s a short level segment before the climb of the Kinsman peaks begins, proving all we�ve come to expect of climbs in the White�s. It goes on forever, and we begin to see again the rocks which make it so tough (often, wooden steps have been bolted into the rock face). The sweat rolls off us, and worse, there are plenty of pseudo-summits convincing us we�re at the top. At one of the occasional outcrops, we get a view of the peak, which projects firmly into the clouds, and before long, we�re immersed in the familiar fog of the AT, remaining so for quite some time. We pass one Welsch gent out on a thru-hike (although he missed a large segment from Harper�s Ferry to Hanover), and once we finally get accustomed to his English, we find that he stayed at Gordon Pond (our planned destination) last night, with a wonderful campsite right on the pond, and a passing moose running through once. This is great news, as everyone else had tried to convince us we wouldn�t find camping here. Buoyed up by this news, we continue to climb into the clouds, our pace now being the concern, as it may prove tough making Gordon Pond by nightfall. 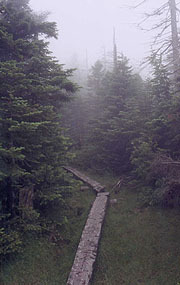 Atop N Kinsman, we run into a GS troop who just came up from Eliza Brooks Hut, having gotten soaked over the night, and seeking a place to dry out (a tough spot, as Lonesome Lake is full, with no camping allowed in the environs, and a long hike to the Notch). We cross both Kinsman peaks in the fog, treated to an eerie but wonderous view starting down South Kinsman, the steep,sheer slope dropping off abruptly into the fog, giving us wonder what lies beyond. The descent is steep and rocky, making for slow progress, and I�m starting to worry a bit about my foot, already hurting a bit. Coleen takes a slip once, landing on the snack sack, but she�s unhurt, and we plod our way down the slope, the rocks generally providing fairly good traction in spite of being dampened by the mist. Soon we emerge from the cloud, though with our view of how far we�ve yet to descend, it only seems further away. At 5:30 disaster strikes at the foot of South Kinsman. We're just approaching the end of the long, steep, and rocky descent when I hear a yelp of pain from behind. Turning around, I can just see Coleen rolling over her pack coming off the previous rock face. I can tell from the tone of her voice that this is no ordinary slip, and heading back over I find her crying in pain, with several bruises and lots of scuffs on her clothes. It looks as if nothing is broken, and I get her pack off, working on getting her off the rock face and only a flat place adjacent. Her left knee has taken a pretty good hit with an audible pop, and there's another when she moves over to the new seat, but feeling around it seems to confirm that nothing's broken, and after giving her a little water and a Snickers bar, I'm able to get her down to a more stable place. We find she can put a little weight on the left leg so long as it's not bent or twisted, and the map shows the shortest way off the mountain is the Reel Brook trail, ahead just past the Eliza Brook shelter. Not knowing how far the shelter is, I decide to run down and recon it, stowing my pack there, and coming back for Coleen and her pack. After making sure she's got everything she'll need, I head down, finding the rocky descent ends almost immediately (to add insult to injury, the sky clears and the sun comes out as well). The terrain eases considerably, though it's a bit longer than expected - a solid 1.5 miles. I run on the flat spots, hoping to get Coleen down by nightfall, but even so I don't get to the shelter until 6:30, finding three folks here, and a couple of tents around. After a quick explanation (one of the guys volunteering to bring down her pack) I tell him I can get it, and quickly make tracks back up. I resume my running, almost immediately tripping on a rock, and putting a nasty gash in my RH palm, with another on the knee. As I'll be no good to anyone injured, I slow to a fast walk, and approaching the base of KinsmanI yell out to Coleen to reassure, getting an immediate response. She's able to walk passably (albeit slowly) using both poles, with me carrying her pack and helping her down over the rocks. We pull into camp at 8:30, finding some of the folks turned in already, but the shelter trio still up and about. The guy who offered to help with Coleen's pack is a thru-hiker, and the other two friends out hiking with him, but unfortunately, none of them know anything about the bailout possibilities up ahead, nor of towns on either side. The mosquitoes are out with a vengeance, so we don jackets and rain-pants, and Coleen suggests we tent, with me erecting the tent as she starts dinner. To lighten the load, we decide to have a Lipton rice dinner with the raspberry crumbcake we'd gotten as trail magic at the trailhead. The rice is lackluster as usual, but the crumbcake is excellent, and we have no problem cleaning out all four servings ourselves, putting on coffee as the raspberries cook. Everyone in the shelter is turning in, and we follow suit, though tenting proves surprisingly difficult, with the mosquitoes rushing for the door, and everything we're wearing clammy with sweat. All my guidebook pages are soaked too, with no place to dry them, but we finally get situated and to bed at 10:45. Sleep proves tough for Coleen with her aching knee, and though I start out warm, I cool throughout the night (in my sheer 50F fleece bag), putting on all my long underwear eventually. I'm up at first light, though Coleen's sleeping soundly, so I let her be until she rolls over at 6:00. She's a bit stiff as expected, but able to hobble up to the privy and back without injury. I pack up as she gets the water started, with our shelter partners just starting to get around as we dine (trying to eat as much as possible to shed weight). I leave behind a bag with much of our food for other hikers (it always disappears quickly) and stow Coleen's gear in my pack; trying to leave Coleen's pack virtually empty. At 7:38 we begin our exit, with easy trail southbound, and me still holding out hope that Coleen can continue on to Kinsman Notch (7 miles ahead, but a far easier place from which to hitch, or to finish the section later). She's plodding very slowly though, making barely 1 mph on the easy portions, so at the Reel Brook trail we decide to exit here, via the shortest route possible. It's a little steep at the outset, but diminishing to an easy and steady descent with a couple of minor brook crossings. It soon emerges underneath some powerlines joining an old jeep road making for easy walking, though I can't quite make it jibe with the route on the map. Finally I concede we're not on the trail, but our destination (NH 112) is in sight, so we stick with the easier route (after all, we're not on the AT anymore, so we can take any route we please now). We pass through a Christmas tree plantation, with the signs of civilization becoming evident, and finally we reach the road, pleasantly surprised to find it paved, with a number of summer cottages here. The first one we try appears vacant, but we hit pay dirt at the 2nd, with a couple dogs inside barking before we even arrive. A woman answers the door (Pat), seeming sympathetic to our plight, and bringing us a mobile phone for our call to Charlie. Unfortunately, he's out, so we leave the number, and she leaves the phone out with us as we wait. All seems to be working in our direction, with the husband (Bob) working on a home-repair project, carrying various pieces of lumber by us to the garage for sawing. On one pass, I ask him if he needs a break from his labors (for the same fee Charlie charged us), and on reflection he recalls a needed shopping mission in Hanover; so after getting clearance from Pat, he agrees to shuttle us there. Last month, I was the suffering one at the section's end - now it's my injured bride. Each time, however, it's a special time together nursing each other back to health. The Doc finds Coleen a victim of a torn MCL (medial collateral ligament), although we'll count ourselves extremely fortunate at this diagnosis. Unlike its nearby partner, the ACL, the MCL almost always heals itself without surgery, and she's allowed any activity her comfort level allows. With a wedding reception and family reunion to attend in August, we hadn't planned to hike then anyway, so we've got until September to get back into shape. It'll barely be time enough.